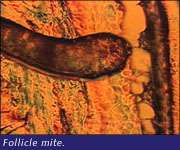 Dust mites are the guys responsible for a lot of allergies (actually it's dust mite doo doo that causes the allergy—ICK!) 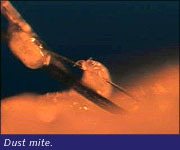 They really like your bed—an average double bed can hold about 2 million mites. Grossed out yet? Want to get out of here? OK. You can go to Joe's Room if you want; nothing scary there. You can go on and learn more about this way cool stuff. But if you do, make sure you have the stomach for it.